YouTube is making a play for developing custom content or content that can't be found elsewhere online as it defends its competitive video position against rival Hulu. 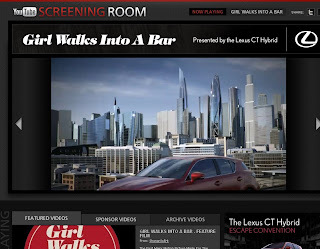 Part of that defense is the YouTube Screening Room which has been around since 2008, but appears to be making a comeback with YouTube finding new sponsors to promote the films. What is the Screening Room? From the channel's description, it features "top films from around the world to find the audiences they deserve... While the majority of these films have played at international film festivals, occasionally you'll find films that have never before screened for wide audiences." Today American Express is sponsoring the Screening Room, but last Tuesday Lexus did its marketing sponsorship duty and brought the Screening Room content to the YouTube audience with a front page banner ad, intro commercial before the film played, and some banners promoting the all-new CT200h filled the screen. I think this also helps Advertisers know exactly what content they are being associated with on You Tube since the user generated content is so random. Could be a laughing baby could be someone calling the president a nazi. I always viewed Twitter and You Tube as Chat Roulette for Advertisers. never know what your ad will be located next too.